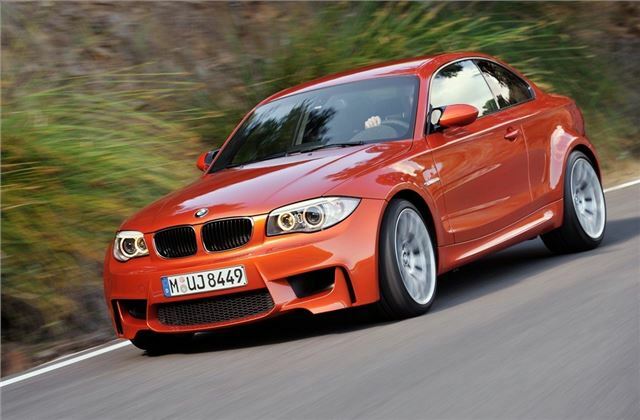 BMW has revealed details of the new 1 Series M Coupe which will go on sale in the UK in May 2011. Powered by a 3.0-litre six-cylinder engine with 340bhp, newcomer will be the entry-point to the M car range but certainly won't be outdone in the performance stakes with a 0-62mph time of just 4.9 seconds. To help it stand out from the standard 1 Series Coupe range, the M Coupe features typical M car styling cues with widened wheel arches, unique 19-inch Y-spoke M alloy wheels and dual chrome tailpipes. A discreet spoiler lip generating additional downforce and a rear apron with side openings echoing the look of the front air intakes ensure the look of sporting intent matches the model's sporting ability. At the back there are L-shaped light clusters with two light banks fed by LED units. Exterior paint finishes are Alpine White non-metallic, Black Sapphire metallic and the exclusive Valencia Orange metalic shown in the pictures here. The BMW 1 Series M Coupe is fitted as standard with twin corona xenon headlamps and LED-fed positioning lights. A hallmark M-branded feature is the elongated chrome gill element on the front wheel arch, while the door mirrors are from the BMW M3, but tuned for the specific aerodynamic characteristics. The standard sports seats in Boston leather feature Kyalami orange stitching and offer both driver and front passenger excellent lateral hold. The interior is exclusively modelled for the BMW 1 Series M Coupe, with an M leather steering wheel and the use of Alcantara with Kyalami orange contrast stitching on the door trim, door inserts, handbrake and gear lever gaiter and instrument binnacle cove. The M logo is also embossed in the front of the headrests. Under the bonnet there is an in-line six-cylinder engine with twin turbocharger, direct injection technology and double VANOS variable valve timing to develop a maximum output of 340hp. The BMW M tuned twin-turbocharger technology used consists of two relatively small turbos which, because of their low inertia characteristics, are active even at low engine speeds, ensuring no turbo lag, yet a peak power output which is achieved at 5900rpm. The great flexibility of the 3,0-litre engine means that maximum torque of 450Nm is produced from as little as 1500rpm. A flat torque curve for swift in gear acceleration sees peak torque maintained up to 4500 rpm. This figure can be increased by another 50Nm when the car is under full throttle by means of an overboost function. In fact, BMW expects it to be significantly faster around the Nürburgring Nordschleife than the previous generation E46 BMW M3. The engine control system of the car allows two differing performance curves: in standard mode the BMW 1 Series M Coupé offers a more torque-orientated, flexible character to the engine's performance delivery, while in M Dynamic Mode (MDM), activated by a button on the steering wheel, engine speeds rocket instantly, accessing the highest power levels as quickly as possible. In addition, EfficientDynamics measures such as brake energy regeneration and needs-based control of auxiliary units ensure that recorded combined fuel consumption is 29.4mpg and CO2 emissions are 224g/km. The BMW 1 Series M Coupé is only offered with a six-speed manual transmission, specially designed to work with high-torque engines. This newly developed transmission is operated using a very short-shift M gearshift lever. The latest M car tips the scales at 1,495kgs courtesy of the extensive use of aluminium. As standard, it comes with Variable M differential lock, compound brakes, DSC with MDM and M Servotronic. The Variable M differential lock responds to differences in rotational speeds in the rear wheels, redirecting torque within a fraction of a second for optimum traction and maximum thrust on slippery surfaces and when accelerating out of bends. The BMW 1 Series M Coupé goes on sale in May 2011 priced at £39,990 OTR, with the first customer deliveries expected in May.